MERIAN -Karstia, Carniola, Histria ef Windorum Marchia. MERIAN, M. - Karstia, Carniola, Histria ef Windorum Marchia. Karstia, Carniola, Histria ef Windorum Marchia. 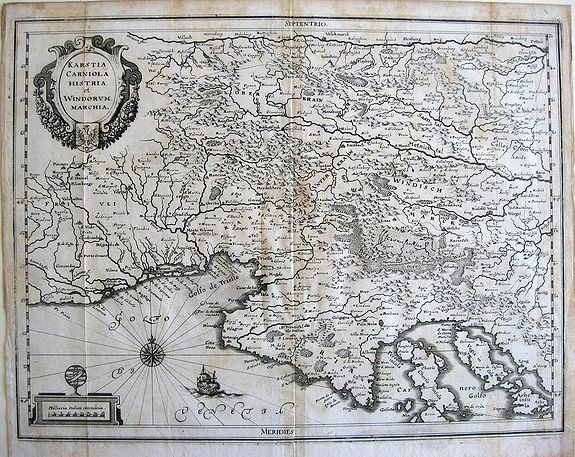 - MERIAN, M.
Title : Karstia, Carniola, Histria ef Windorum Marchia.. Size : 11.6 x 13.5 inches. / 29.4 x 34.3 cm. Description :Map of Slovenia, Dalmatia, Austria, Trieste. Merian was a notable Swiss engraver, born in Basle, subsequently studying in Zurich and then moving to Frankfurt where he met Theodore de Bry, whose daughter he married. In Frankfurt he spent most of his working life, and with Martin Zeiller, a German geographer, and later with his own son, he produced a series of Topographia consisting of 21 volumes including a very large number of town plans as well as maps of most countries and a World Map-a very popular work issued in many editions. He also took over and completed the later parts and editions of the Grand Voyages and Petits Voyages originally started by de Bry in 1590. Condition : Cropped margins, a small, minor fold on left margin.